Jewelry findings are the parts and components used in jewelry making and typically include anything other than the actual beads or spacers used in the piece. Jewelry findings help to connect the components to make a completed piece. Some examples of jewelry findings include clasps, bails, and split rings. Here we will take a closer look at some of the specific types of findings and their uses. Earrings are a fun jewelry accessory to make and can be created in a variety of ways using various jewelry findings. If you are creating a hook style of earring, you will require ear wires. An ear wire is a bow of wire that is made from a metal and looped to act as a fastener for the earring on an ear piercing .Common styles of ear wires include French wires, also referred to as French hooks. These are a popular style and are comfortable to wear. They are also available in a wide variety of sizes and types of metals. Leverbacks are another popular style of ear wire that feature a hinge that fastens the earring securely to prevent loss. Leverbacks feature loops or rings at the bottom from which dangles or beads can be attached. Aside from the hanging styles of earring jewelry findings, there is also the classic post. Post earrings are the straight style that goes straight through the ear piercing hole and requires a fastener in the back to hold the post in place. Posts may come with a small hole from which you can attach a dangle or beads, or they may have a flat pad or small cup to which you can affix some type of stone or bead. Posts are also available in several metal types including sterling silver, gold, base metals, and plated pewter. Head pins are straight wire pieces on which you can slide one or more beads onto to form a wrapped or simple loop on the open end. Head pins prevent the beads from sliding off the piece, and the end of it can be flat, decorative, or round. The dangles that are created using head pins can be connected to other findings or chained together to form necklaces, bracelets, or earrings. 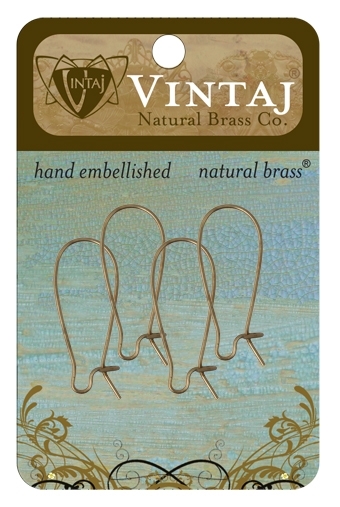 Head pins can be purchased in various lengths and gauges and are made from an assortment of different materials. Eye pins differ slightly from head pins in that the wires end with a small loop which can be attached to another eye pin, clasp, head pin, or other type of jewelry finding. Eye pins allow for the links to be connected to produce chains or longer dangles. Eye pins comes in various gauges, lengths, and materials. One of the most classic and popular types of clasps is the lobster clasp, or lobster claw clasp. Lobster clasps connect securely to a jump ring or split ring on the other end of the jewelry piece by using tension from a spring loaded mechanism that provides secure closure. These clasps come in various sizes and styles. Toggle clasps are another popular way to finish up a bracelet or necklace piece. Toggle clasps are easy to use by attaching a toggle bar to one end of the piece, and a toggle ring to the other end. The bar pivots to slip inside the ring, where it is pivoted once again to provide secure fastening. Bead caps are decorative embellishments that add a touch of sophistication to individual beads. The caps can be used on one or both ends of the bead. Bead caps come in shapes that resemble a simple disc, flower petals, stars, rope trim, and petals. Jump rings resemble a wire circle with a slit in it where it can be used to attach charms to other elements, or to attach wire elements together. Jump rings can also be used as a catch when using S clasps and lobster claws. If left open, the jump ring can be opened and re-closed using pliers, or they may be soldered together to make them more secure. Split rings are a variation of the jump ring that has a double loop of wire that makes them a bit more secure than the open jump ring style. Crimps beads are used when making jewelry using beading wire. They help to finish off a piece of jewelry. or can be used to keep a clasp or end piece from moving up the wire, while at the same time allowing the clasp or end piece to still move freely. The crimp bead can be close by using special crimping tool or a pair of pliers. A bail is a jewelry finding that allows you to turn a bead, stone, or other component into a pendant that will hang from the chain or cord of the piece. Bails come in many styles such as donut bails, glue on bails, prong bails, and loop bails. They can also be found in a variety of different metals. Bails can be very simple or very detailed . There are so many jewelry finding options that we have just scratched the surface here. These components give us a brief understanding about how jewelry is assembled to create a finished piece. For interesting jewelry projects, and how-to ideas and inspiration, check here.